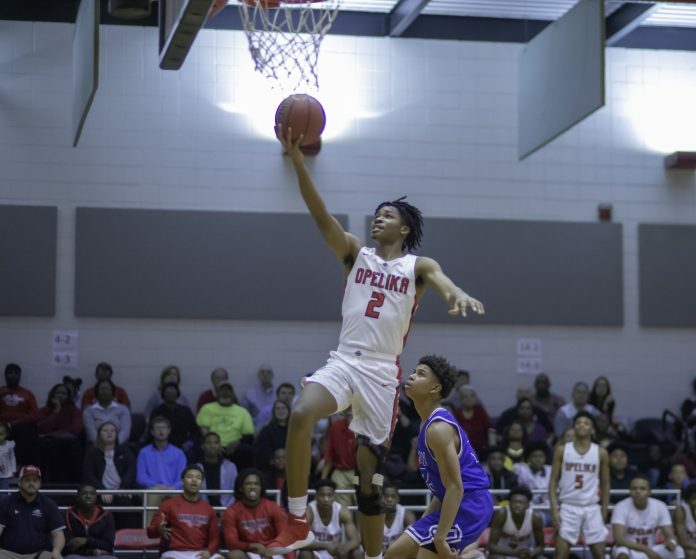 The Opelika High School boys and girls basketball teams will play in the finals of the area tournament championship Thursday. Both teams play the winner of Russell County/Benjamin Russell in the first-round game played Tuesday. No results were available at press time. The Lady Bulldogs will tip off at 5 p.m. and the boys follow at 6:30 p.m. The winner of the area tournament will host a sub-regional game and the loser will travel in the first round. Opelika hosted Auburn last Thursday at the OHS Sports Arena in the final regular season game and Senior Night. The Auburn girls beat Opelika 29-12 in the first quarter,, after making seven 3-point shots. Opelika shaved four points off the deficit in the second quarter, trailing 37-24 at halftime. The Lady Bulldogs outscored the Tigers 14-6 in the third quarter and trailed only 43-38 heading to the final quarter. The Lady Tigers, laden with eight seniors, managed to handle the home Opelika’s home crowd and the strong push from Coach Devin Booth’s team to win 58-53. Opelika was led by Quala Walton’s game high 16 points followed by Claire Worth’s 15 points. The Opelika boys beat Auburn 61-47, sweeping the 2-game series with the Tigers. The Bulldogs were led offensively by Taye Fields who scored 16 points. Brandon Howard added 14 points along with 10 points each from Jared Willis and Trey Boone. The Opelika girls play Monday in the sub-regional round of the AHSAA 6A basketball playoffs Feb. 11 at the OHS Sports Arena. The opponent would come from Area 8 tournament runner-up, an area that includes, Chelsea, Pelham, Helena and Calera. Coach John Wadsworth’s team will play in the sub-regional round of the AHSAA basketball playoffs Feb. 12 at the OHS Sports Arena. Like the girls, the Area 8 runner-up will travel to Opelika. NOTE- If the area runner-up for the girls and boys are from the same high school, the schedule could change to prevent two nights of travel. The Wrestling Bulldogs finished second at the 5th annual “Hornet Slam” at Beauregard High School. Opelika finished first and second in the following weight classes: Heavyweight Cameron Reese won the championship along with Bevin Williams in the 220-pound class; Trint Vaughs – 195 pounds and Cameron Williams – 132 pounds. Second-place finishers were Cole Lazzari – 170 pounds and Zeak Jones – 153 pounds. NOTE- Dawson received some bad news a couple weeks ago. Dawson, undefeated in the AHSAA this season, injured his elbow and will not be able to finish the wrestling season. He is expected to be back in time for spring football. The OHS boys indoor track team finished third last weekend at the AHSAA Indoor Track and Field Championship INSIDE Birmingham’s Crossplex. The 4×100-meter relay team won the championship with a time of 1:30:54, Brantan Barnett finished second in the 60-meter dash (6.98), Jaylen Stinson was second in the long jump (21-4.5) and Daniel Kindred placed third in the 60-meter hurdles. Several other members of the team scored points. Opelika’s girls finished 11th in the indoor championship. A’Nyiah Hughley led the team with a second- place finish in the shot put. (37-1.25). Opelika Dixie Youth Baseball is now taking registration online at opelikadixieyouth.com. The League is open to 7-12 year olds interested in playing baseball. The registration fee is $80 per player, which includes jersey and cap. See the website for brother rates or scholarship information.